This week, the Pacific Biosciences SMRT Grant announced the lucky winner of the World’s Most Interesting Genome competition. The contest was voted on by the public and a dingo named Sandy won the day. But was that the right decision? No, Sandy is kind of like a doggo and it’s clear that voters let her cuteness win out over far more interesting genomes. The winning team in the grant competition will receive complete PacBio genome sequencing and assembly courtesy of the Arizona Genomics Institute and Computomics. Each team outlined the reasons that their current biological obsession should receive the designation of being “most interesting” and how their research might benefit the world. Right off the bat, you can see that the teams who added a cool descriptor before the name of the chosen species have an advantage. In this case, the sea slug is “solar-powered.” Boom. That’s interesting. What’s it mean? Well, as the team puts it, the sea slug is able to “steal and maintain the chloroplasts of its algae food.” Chloroplasts being “the little solar-panels where photosynthesis takes place.” Once the sea slug consumes the algae, it’s able to store the plastids in its digestive tract where they remain active. Photosynthesis continues and a starch reservoir builds up allowing the sea slug to go up to three months without additional food. No one knows how this works. Who knows where this research might have gone. But let’s hope they keep at it and it leads to a way for humans to go months without eating if they need to. You can see a video of the sea slug here. Hell yeah, snek! Obviously, this one’s a badass and was rewarded with second place. First of all, the temple pitviper is found in the Snake Temple of Penang, Malaysia which is a fascinating place itself. Its venom contains four toxins that aren’t present in other snake species’ venom. Male and female snakes aren’t usually very different in other species but fully grown temple pitviper males are small and green, while the females are colorful and can grow up to ten times larger than the male. But newborns all have the male appearance. If they had won, the researchers intended to study the temple pitvipers’ unique venom in hopes of discovering new medicinal applications. Venom has previously aided in the development of drugs for hypertension, acute coronary syndrome and more. They also planned to study the strange sexual development of the species. Here’s hoping they find a way to pull it off. You can see a video about the temple pitviper here. Alright, I’m sorry but the pink pigeon is the clear loser. Pigeons are gross. Even pigeons that are endangered and a cousin of the extinct dodo. To be clear, all of the candidates were worthy but there can only be one winner and the pink pigeon is not even as cool as the dingo. But the researchers are only looking to use the pink pigeon as a subject to identify potential genetic reasons for its decline and apply that knowledge to other endangered or vulnerable species. Maybe they’ll find another way without such stiff competition. You can see a video about the pink pigeon here. As a rare, wild-born pure dingo, she provides a unique case study. Pure dingoes are intermediate between wild wolves and domestic dogs, with a range of non-domesticated traits. So sequencing Sandy’s genome will help pinpoint some of the genes for temperament and behaviour that underlie the transition from wild animals to perfect pets. The team also hopes their research will provide answers for where the dingo originated and how to help conserve its population. It’s hard to hate on Sandy, she’s cute like a dog and people want to know more about the origins of dogs. She took 41 percent of the vote and I get it. But doesn’t mean I have to like it. You can see a video about Sandy the dingo here. This is a competition based on how “interesting” a selected creature is, and I submit that the “explosive” bombardier beetle has it all. Through what looks like a fart, the beetle can aim and fire a boiling hot mixture of chemicals at its predators without doing any damage to itself. What’s baffled scientists for decades is the odd way in which this beetle keeps the three ingredients that make up its chemical weapon separate until they’re needed. The explosive discharge only occurs when the chemicals are combined at exactly the right moment and some have even speculated that this disproves the theory of evolution. The argument being that as the beetles evolved, they would have just blown themselves up. The obvious counterargument is that the third enzyme that triggers the explosion evolved over time and it didn’t become so dangerous until the beetle’s body had adapted to contain it. The team wants to trace the genomic evolution of the bombardier beetle and outline this process once and for all. It would simultaneously increase our understanding of evolution while removing a favorite example from the intelligent design contrarian’s arsenal. 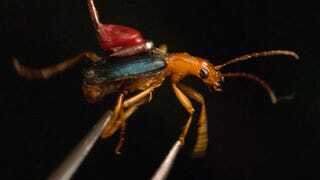 You can see a video about the bombardier beetle here. Maybe you disagree. Maybe you’re a dingo lover. Or maybe you like the more practical potential applications of the pitviper research rather than the theoretical ambitions of the beetle. Tell us who should have won.